PfC develops and applies new tools, methods and forms of cooperation to address societal problems. We seek cooperation across a variety of sectors in order to build solutions that are sustainable – financially, socially and environmentally. PfC always works through local partners and employs business methods to create enduring results. Together with partners at the local and national levels we identify needs and arrive at the best solutions. We believe in local responsibility and ownership. 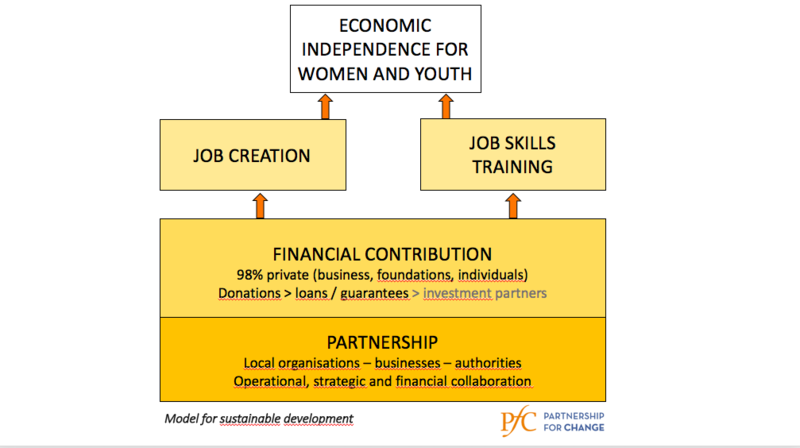 We have developed an operational model (see figure) which integrates financial aid among its components. Our contribution is multifaceted. We provide strategic and operational support; transferring expertise is a crucial aspect of development work. Our financial contribution is based on a pragmatic principle whereby we provide donations, loans, guarantees and direct investments, depending on what will be most effective in each project. If appropriate, we involve other partners. Once a project is able to stand on its own, we withdraw from active involvement or bring in investors if the project would benefit from this. PfC’s approach to achieving social change is often described as venture philanthropy. To read more about different concepts in philanthropy and social entrepreneurship, please click here.